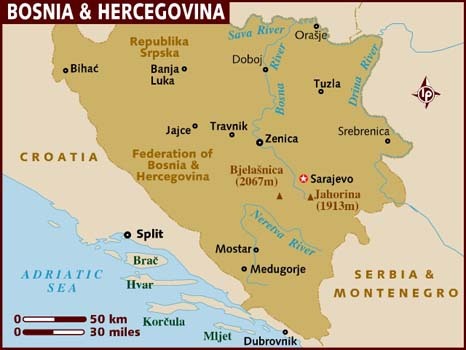 Bosnia and Herzegovina is situated at the heart of the Balkan Peninsula in southeast Europe. 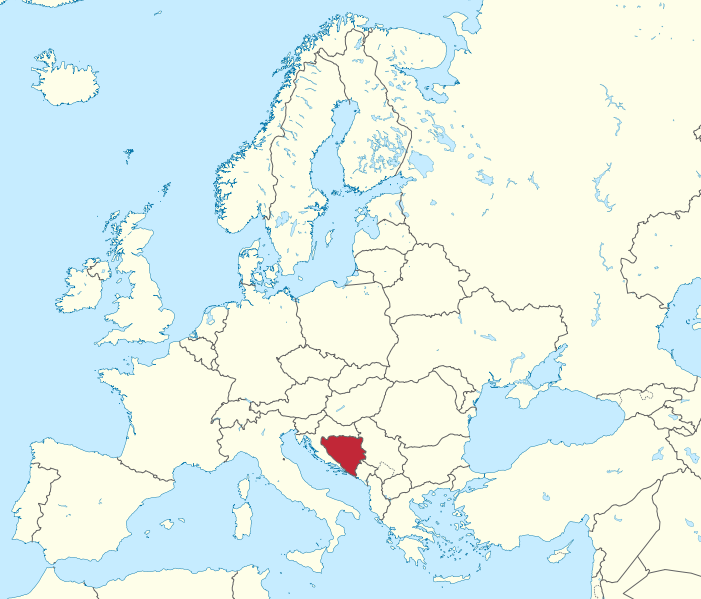 It borders on Croatia, Serbia, Montenegro and the Adriatic Sea. The capital city is Sarajevo. 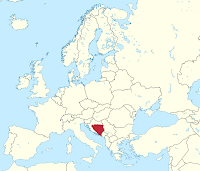 Bosnia and Herzegovina encompasses both Mediterranean and Alpine climates, landscapes and henceforth some of the richest flora and fauna found in Europe. Here eastern and western civilizations met, sometimes clashed, but more often enriched and reinforced each other throughout its long and fascinating history. From the beauty of the mountains’ various landscape (like the Sutjeska National Park) to the calm of the Adriatic Sea (at the Neum seaside resort), from citadels and castles (like the one in Travnik) to peaceful monasteries, this small country has many things to enchant those who pay a visit. Air quality problems have been observed in major urban and industrial areas. Air quality is also accentuated by soot, slag, barren soil, and ash owing to inadequate disposal and treatment of industrial waste, as well as traditional burning of household waste. The last years witnessed an increase in the pollutant emissions from non-stationary sources, specifically from traffic. Urban population in Bosnia and Herzegovina is not fully supplied with safe and treated water. Specific data on the quantity of lead, pesticides, nitrates and microorganisms in drinking water samples is limited or not available. Groundwater remains polluted, with uncontrolled use of fertilisers and chemicals, untreated sewage and leaching from contaminated soils. The contamination of surface waters by household and industrial waste poses a serious risk. Eutrophication of rivers is sometimes a problem. Although in Bosnia and Herzegovina forestland covers 52% of the territory, soil erosion, due to deforestation, poor land management practice and overgrazing of livestock are important contributors to environmental degradation. 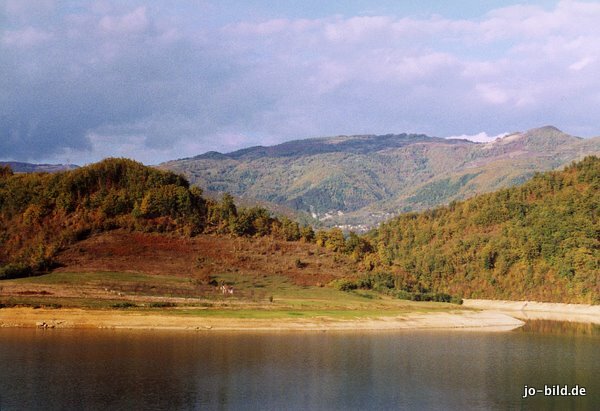 10% of the territory of Bosnia and Herzegovina is badly damaged by erosion. Soil is additionally degraded by industrial and household waste dumps. Industrial waste presents a major threat to the land. There has been little if any substantive rehabilitation of former chemical and fertiliser plants, open pit coal and other mines. A specific post-conflict situation concerns land mines and unexploded ordinances. Until these are cleared, the opportunities for reconstruction and agriculture are severely limited. Use of pesticides in agriculture has declined. In Bosnia and Herzegovina, 0.5% of the country is under protection. Mountain Vlasic has been exposed to deforestation activities despite having biodiversity of global significance. Of 72 mammal species, 10 were considered threatened as of 2001, as were two species of birds and six species of freshwater fish. Endangered species include the slender-billed curlew, Danube salmon, and the field adder. It is expected that the average annual temperature will increase, and average net precipitation will decrease under the impact of climate change. Erosion, soil deficiency, and an increase in water temperature will occur in coastal areas. Due to changes in precipitation, there will be a decrease in the quantity of water flow in rivers and a shortage of water supply for households and industry. The country’s infrastructure will also be negatively affected: there is an increased risk of landslides, flooding and traffic accidents during summer. Interaction between ordinary citizens and local governments was mostly inadequate before 2003 in Bosnia and Herzegovina. Decisions were often taken literally behind closed doors and with no oversight. In the years 2003 and 2004, the Local Government Support Activity Project has developed domestic capacity to initiate and develop issue-driven public participation processes. The purpose was to create opportunities and vehicles for citizens to relay their priorities and concerns, and for local governments to explain the constraints they work under and develop the institutional culture of seeking and receiving citizen feedback. The program also increased citizen input into local government decision-making. Over the past couple of years, BiH citizens are increasingly motivated to participate in local governance processes that impact their own lives. In general, cooperative actions on issues of public interest have increased. The number of registered NGOs in BiH was estimated to be more than 12,000 in 2008. Although more work needs to be done to increase citizen involvement and philanthropy, there is a clear increase in informal support for diverse NGO initiatives. The public shows greater understanding of and support for NGOs’ work. Web technology allows the public to find information about NGOs and to participate in NGOs’ activities and debates. The overall level of NGO sector sustainability did not improve significantly in 2009, though there were some improvements in organizational capacity, infrastructure and public image. Recruitment of volunteers by NGOs has slightly increased, yet few organizations have made it a practice to recruit interns or volunteers. NGOs generally remain unable to sustain full-time staff, and most employees work on a volunteer or project basis. The range of goods and services provided by the NGO sector is still underdeveloped and services in spheres other than social services remain underfunded. NGOs still lag behind when it comes to self-regulation, transparency in their internal operations, and the publishing of annual reports. According to OECD there are about 11 environmental taxes in Bosnia and Herzegovina, among which 4 regard fuel and vehicles, 4 regard water, 1 regards waste, while the remaining 2 refer to use of resources and forestry. Although neither the State nor the entities have an environmental policy, some important programmes for environmental action have been prepared and adopted in recent years. The Global Framework Strategy for Economic Development in Bosnia and Herzegovina for 2001-2004 touched on some related issues. And, in Republika Srpska, pursuant to its new Law on Environmental Protection, work has begun on drafting an environmental protection strategy. The National Environmental Action Plan (NEAP) was the first document specifically oriented to environmental problems. It was prepared with the participation of representatives from ministries, scientists from research institutes and academic institutions, and NGOs. The eight priorities identified in NEAP are: water resource management and waste-water treatment; sustainable development in rural areas; environmental management; protection of biological and landscape diversity; waste and waste management; economy and sustainable development; public health; and demining. There are also some local initiatives to develop local environmental action plans (LEAPs) in both entities. Much attention has been given to the finalization and approval of the Poverty Reduction Strategy Paper or Mid-term Development Strategy of Bosnia and Herzegovina. The Paper gives a broad overview of the national economic and social situation in all sectors, including the environment and water. The priorities of the environment sector identified in the Paper, including in its Action Plan, generally follow those set out in NEAP. The Council of Ministers has adopted an initiative to draft a strategy for environmental protection and sustainable development. In 2002 both chambers of the Parliamentary Assembly supported the drafting of this document, and the House of Peoples of the Parliamentary Assembly also required the Council of Ministers urgently to prepare an action plan for drafting the strategy. Other environmental policy-making documents are the Mediterranean Action Plan and the State Strategy for Solid Waste Management. A biodiversity strategy and a nature protection strategy are planned. There is no policy for water management and water protection. Some strategic documents prepared in the former Yugoslavia such as the Water Management Master Plan (published in 1994) are still followed in both entities. BiH as a country is far from a regulated system in which social security or a legal structure, which protects human, economic and other rights, can be found. But the companies in BiH and their management represent a substantial potential for change in overcoming the existing situation in the country. The majority of managers in BiH support CSR activities, but the biggest companies in BiH are the most successful ones within the CSR field. However, the knowledge of BiH managers in general about CSR is not on a satisfactory level. Moreover, the companies do not implement CSR activities strategically. On a large scale, CSR is still an undeveloped concept in BiH. Furthermore, CSR is not embedded into the companies’ core business and there is no long-term commitment to CSR. Moreover, companies in BiH primarily involve in promotional activities such as sponsorship of different events. The reason for this is their unawareness of CSR benefits, their lack of resources as well as the lack of knowledge about the implementation of CSR strategies. CSR works very well in companies in developed countries because its application is largely regulated by various economic and legislative frameworks. In BiH those frameworks do not exist, which is the main reason why corporate philanthropy, such as donating money to culture and sport, remains the major CSR initiative in this country. Large companies implement CSR activities because they know that this is one way to keep their competitive position in the marketplace, while small and medium-sized enterprises are lagging behind, and most of them are not aware of CSR.